In December 1979, a Detroit tradition began when the Red Wings took the ice for the first time at their new riverfront home, Joe Louis Arena. Named after former heavyweight champion boxer Joe Louis, the stadium that became affectionately known as "The Joe" saw the renaissance of the Red Wings franchise, including four Stanley Cup championship seasons and a 25-year run of advancing to the playoffs. 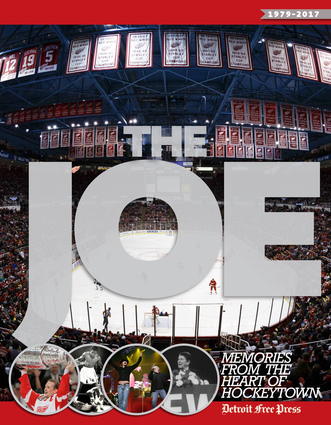 The Joe: Memories from the Heart of Hockeytown takes a look back at the storied history of Joe Louis Arena in this, its final year. The arena has witnessed many stories, recounted with admiration in The Joe. Red Wings greats from Gordie Howe to Steve Yzerman to Nicklas Lidstrom skated on The Joe's storied ice, and time-honored rivalries, such as those between the Red Wings and Colorado Avalanche, were played out in dramatic fashion. The stadium has spawned such personalities as Al the Zamboni driver, who twirls octopuses overhead, the Knitting Lady, the Guy in the Orange Hat, and Mo Cheese. The Joe also hosted a number of unforgettable non-hockey events, from Ronald Reagan's nomination at the 1980 Republican convention, to the start of Prince's Purple Rain tour in 1984, to N.W.A. 's controversial concert in 1989, to Bob Seger joining Kid Rock on stage during Super Bowl week in 2006. The Joe offers a comprehensive tribute in words and pictures to hockey's last old-time arena. Learn about the history of the Red Wings and The Joe and the unforgettable games played there, as well as a number of key events in Detroit's history. For anyone who has cheered on the Red Wings over the past three-plus decades, this book is not to be missed. The Detroit Free Press is the largest daily newspaper in Michigan, with a daily circulation of more than 200,000 copies. Founded in 1831, the newspaper has won 10 Pulitzer Prizes. It is based in Detroit, Michigan. Since December 1979, the Detroit Red Wings and their fans have called The Joe their home. But after almost 40 years that witnessed countless fan memories, remarkable off-ice moments and the renaissance of Detroit Hockey, including four Stanley Cup Championships and a record-setting 25 straight years of playoff appearances, it’s time to bid a fond farewell to this beloved arena. The Joe is filled with fond memories one of sports' iconic venues and takes a look back at the storied history of Joe Louis Arena in this, its final year. The Joe offers a comprehensive tribute in words and pictures to hockey's last old-time arena. Learn about the history of the Red Wings and The Joe and the unforgettable games played there, as well as key events in Detroit's history. Anyone who has cheered on the Red Wings over the past three-plus decades will not want to miss this book.